Just like Ben Jonson's jest at Shakespeare I too have to admit having little Latin and less Greek. I have attempted to use the little Latin I have to translate the title of Jonson's 1621 masque News from the New World Discovered in the Moon into Latin. When I started to write my blog it was my intention to look at Shakespeare's plays to see if the Tudor Telescope could help elucidate them or provide a useful commentary to them. My original plan was to stop in 1610 as Galileo's publication of Sidereus Nuncius and his description of a working refracting telescope totally changed astronomy. Whilst it can be debated if William Shakespeare ever read Sidereus Nuncius or not, there is absolutely no doubt whatsoever that Ben Jonson did. The masque News from the New World Discovered in the Moon draws on Sidereus Nuncius and also Lucian of Samosata's Vera Historia published in 125 CE. I have seen Ben Jonson's play Volpone with Richard Griffiths taking the lead at The Pit in London in 1984, however, the supporting characters were not as well developed as they generally are in Shakespeare's plays and even Volpone is rather fixed in his avaricious ways. In Shakespeare's plays characters evolve during a play as they are changed as they react to the events going on around them but with Jonson characters they are set in their behaviour. However, my recent discovery of Ben Jonson's masques has transformed my opinion of him. They display a light nimble wit mixed with intellect. The humour is generous without the cutting satire that appears in his plays. Possibly the Ben Jonson who wrote the masques was an older wiser person than the author of The Alchemist over ten years earlier and also someone who had realised that a payment of £40 per masque (Over £20,000 in today's money) plus being on good terms with the King and receiving a annual pension from the King was something to encourage. Jonson's relationship with King James brought him both increased honour and wealth. 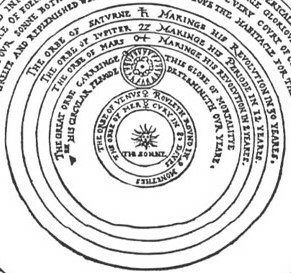 Before looking at News from the New World let us look at what Thomas Digges writes in A Perfit Description of the Calestial Orbs in 1576 (his appendix to Prognostication Everlasting). The Globe of Elements enclosed on the Orb of the Moon I call the Globe of Mortality because it is the peculiar Empire of death. For above the Moon they fear not his force, but as the Christian Poet saith: Omne quod est supra lunam, æternumq bonumq Esse scias nec triste aliquid Cælestia tangit. Quicquid vero infta Lunae Conuexa Creavit Omniparens, natura, malum est, mortisq severas Perpetitur leges & edaci absumitur ævo. The Moon's Orb, that environeth and containeth this dark star and the other mortal, changeable, corruptible Elements & Elementate things is also turned round every 29 days 31 minutes 50 seconds, 8 thirds, 9 fourths, and 20 fifths, and this period may most aptly be called the Month. Digges also includes a figure reproduced below. So despite his endorsement of the radical Copernican heliocentric theory Digges still believed in the concept of quintessence, the incorruptible fifth element beyond the orbit of the moon. This was the view of Aristotle and Empedocles in the fourth century BCE. In the medieval period some people thought that the face of the Moon which they could see was largely made of quintessence but did contain a small amount of the four terrestrial elements (Earth, Water, Wind and Fire) which accounted for its light and dark patches when viewed from Earth. The picture below from Splendour Solis shows an alchemist with a banner in Latin saying "let us ask the four elements of nature?". "I say that it appears that you [Foscarini and Galileo] have acted prudently in being satisfied with speaking of Copernicanism as an hypothesis… ". Cardinal Bellamine felt that Galileo had not produced enough evidence to support Copernicus's Heliocentric Theory and so long as Galileo was only proposing models and hypotheses without claiming them as facts there was no heresy. Galileo's problems were to come later when he did just that!! 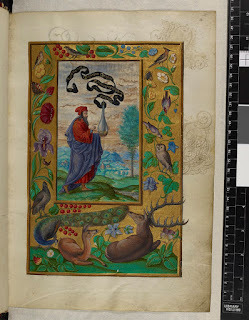 Jonson in his masque News from the New World Discovered in the Moon uses Sidereus Nuncius as a starting point to describe an Earth like Moon populated with animals and strange peoples. After a brief prologue about newspapers publishing and even reprinting "fake news" (yes really! Jonson was that topical) one of the two heralds announces that he has news from the Moon. There then follows a brief speculation as to the origin of this news. Printer. Oh, by a trunk! I know it, a thing no bigger than a flute-case: a neighbour of mine, a spectacle maker, has drawn the moon through it at the bore of a whistle, and made it as great as a drum-head twenty times, and brought it within the length of this room to me, I know not how often. Chronicler. Tut, that's no news; your perplexive glasses are common. No, it will fall out to be Pythagoras' way, I warrant you, by writing and read i' the moon. Printer. Right, as well read of you, i' faith; for Cornelius Agrippa has it, in disco lunae; there 't is found. 1 Herald. Sir, you are lost, I assure you; for ours came to you neither by the way of Cornelius Agrippa nor Cornelius Drible. 1 Herald. No philosopher's phantasie. The Printer is describing a Dutch Trunke which must have been known to the King and Court. Drebbel moved to England from Middelburg in 1604 and returned again in 1612 and he was known at court so possibly he had demonstrated a telescope to King James. The Chronicler dismisses perplexive glasses as being "common" which agree with my earlier blog posts that some sort of optical device for magnification was well known in the Tudor period. The Mathematician Perspecil mentioned by the second Herald is a magnifying glass (Galileo called his telescope a Perspicillum). Factor. Where? Which is he? I must see his dog at his girdle, and the bush of thorns at his back, ere I believe it. So just like in a Midsummer Night's Dream the Moon is though to contains a man, a thorn bush and dog. The herald then announce that the Moon is similar to the Earth. 1 Herald. With navigable seas and rivers. 2 Herald. Variety of nations, polities, laws. 1 Herald. With havens in 't, castles, and port-towns. 2 Herald. Inland cities, boroughs, hamlets, faires and markets. 1 Herald. Hundreds and wapentakes! Forests, parkes, coney-ground, meadow pasture, whatnot? The heralds then proceed to talk of the strange creatures that inhabit the Moon. 1 Herald. Only one island they have is called the Isle of the Epicoenes, because there under one article both kinds are signified, for they are fashioned alike, male and female the same; not heads and broad hats, short doublets and long points; neither do they ever untruss for distinction, but laugh and lie down in moonshine, and stab with their poniards; you do not know the delight of the Epicoenes in moonshine. 2 Herald. And when they ha' tasted the springs of pleasure enough, and billed, and kist, and are ready to come away; the shees only lay certain eggs (for they are never with child there), and of those eggs are disclosed a race of creatures like men, but are indeed a sort of fowl, in part covered with feathers (they call them VOLATEES), that hop from island to island: you shall see a covey of them if you please, presently. he replies there are three ways, Endymions way, Menippus's way and Empedocles's way. "There are in all but three ways of going thither: one is Endymion's way, by rapture and sleep, or a dream. The other Menippus's way, by wing, which the poet took. The third, old Empedocles' way, who, when he leapt into Aetna, having a dry sear body and light, the smoke took him and whift him up into the moon." In his masque Jonson also manages to jest about lawyers and dandies. Later on there was communal dancing for the members of the court and Royal household followed by four songs the last of which was extremely flattering to the monarch. Unlike the theatres which had a bare stage on which the actors performed the masques had a succession of painted canvas backdrops designed by Inigo Jones. 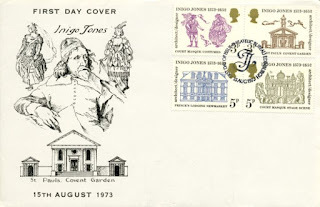 King James liked Jonson's masque performed on Jan 7th 1620 so much that it was repeated on 29th February. 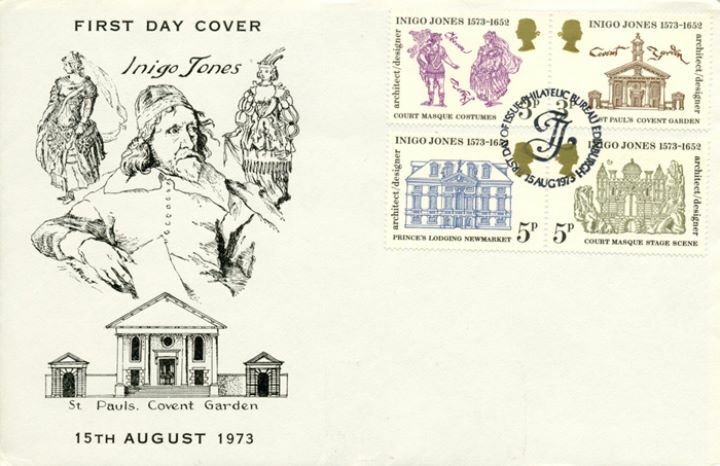 Inigo Jones was celebrated by a set of postage stamps issued by the Royal Mail in 1973. Jonson's masque shows us that telescopes were known in England in 1620 and were better than perspectives which were no longer considered novel and worthy of being news. No one seemed shocked by the Earth like descriptions of the Moon in Jonson's masque so Galileo's pamphlet Sidereus Nuncius from 1610 must have been widely circulated and read by 1620 and possibly many common people and courtiers had verified Galileo's observations for themselves.